ALBERT PIKE RECREATION AREA  As the Little Missouri River churned through the campground, uprooting trees and carrying away RVs, Kerri Basinger turned to her husband Shane. Only moments earlier, roused by their husbands from a deep sleep, Kerri and her best friend, Candace Smith, had grabbed their four young children and fled their Wildwood RV. The two families had made a run for the Smiths’ Chevy pickup, hoping to escape floodwaters that seemed to grow higher with each frantic step. The truck started, but water gushed into the cab. Now they huddled in the bed of the pickup, soaked and shivering. The swollen river roared, prompting the children to shriek in terror. A surge of water slammed a red truck into the Chevy and pinned it against two trees. Seconds later, an RV crashed into the red pickup. Kerri could hear the people trapped inside, banging on the door and screaming in desperation. Shane crawled across the red pickup and onto the trapped family’s RV. Kerri could see her husband only when flashes of lightning illuminated the terrifying scene: Shane, pounding and clawing at the roof, the people inside crying for help. Kerri begged him to come back. She admired her husband’s courage, but at the same time, she worried that she wouldn’t be able to hold onto both of their daughters if the water continued to rise. “I’m not letting these people stay in here!” he yelled, and continued to beat his fists against the RV. When his efforts proved futile, Shane reluctantly retreated. Kerri lifted her daughters — Jadyn, 8, and Kinsley, 6 — to the top of the pickup’s toolbox. She grabbed the girls’ beloved baby blankets and wrapped each one around their small, trembling shoulders. A towering swell of water swallowed the Smiths’ truck. And as the turbulent water swept her away, Kerri held tight to her girls. Less than 12 hours earlier, on June 10, the Basinger and Smith children had romped gleefully along the banks of the normally placid Little Missouri River. Dark clouds, pregnant with rain, hung low. But the looming promise of bad weather didn’t diminish the children’s enjoyment. Jadyn, her face dotted with tiny freckles, wore a black two-piece decorated with peace signs; Kinsley a polka-dotted tankini. The calm water barely reached Jadyn’s waist. In most places, it lapped at the children’s ankles, even those of the youngest two, Joey Smith, 5, and his sister, Katelynn, almost 3. Jadyn Basinger and Joey Smith, ages 7 and 4, play in the Little Missouri River during their families’ 2009 vacation at the Albert Pike Recreation Area. Jadyn and Joey, who referred to themselves as best friends, loved swimming in the docile river. The Basinger and Smith children had grown up together, their devotion to one another a testament to their mothers’ close friendship. Katelynn, with her mop of curls, looked uncannily similar to Kinsley. She toddled after the older girl each weekend when the two families got together for cookouts. Joey, a madcap little towhead, considered Jadyn his best friend. Kerri and Candace’s friendship went back nine years. The women met at a dental practice, where Candace managed the office and Kerri worked the front desk. Kerri married Shane in 2000. When Candace wed Anthony in 2003, Shane was part of the ceremony. The two men had forged a strong friendship, despite their many differences. Anthony favored crisply ironed preppy clothing, while Shane’s usual attire consisted of Carhartt jeans and a cap. Anthony appeared reserved at large gatherings, becoming jovial only when hanging out with small groups of people he knew well. Shane, on the other hand, relished his role as an outgoing prankster no matter the setting. While the men didn’t appear to have much in common, they shared a love for the outdoors and an intense devotion to family. Anthony and Candace lived on a 358-acre cattle farm outside of Shreveport. Shane worked at the farm, but he and Kerri lived in town, where Shane held a second job at Intier Automotive. In their free time, the men either fished or careened along trails on their Mule ATV. Sometimes, they told their wives they had to work on a fence, which meant they were heading to “The Man Spot.” The little outdoor hideaway boasted a wooden spool, which served as a table, a couple of chairs and a stash of beer. Shane and Anthony also both had sons from previous relationships. Kyler Basinger was 14; Austin Rachal, Anthony’s son, was 13. When the new babies started arriving, the two families relished their weekends together even more. Candace and Kerri loved watching their children grow and play together. And every summer, the Basingers and Smiths vacationed together at the U.S. Forest Service’s Albert Pike Recreation Area. Cradled by the rugged Ouachita Mountains and bisected by the Little Missouri River, the 260-acre park and campground draws generations of families year after year. Children spend hours at the swimming hole while their parents enjoy the soothing sounds of a lazy river and the solitude of a remote campsite. Loops A and B, which offer only tent or primitive campsites, are on the west side of the river. Loops C and D are upstream on the east side. Loop D’s eight sites have electric and water hookups for RVs. Loop C, in the midst of a renovation that includes hookups for 12 RVs, has been closed for several months. A trip to Albert Pike means truly getting away. Cell phones don’t work there. Nor does the Internet. Weather radios became operable only within the past month. Volunteer camp hosts, usually retired couples, are responsible for registering guests. The hosts answer campers’ questions and report any problems to the district ranger’s office in Glenwood, about 26 miles away. The Smiths and Basingers usually didn’t stay at the federal campgrounds, instead opting for the privately owned Lowery’s Camp Albert Pike RV Park and Cabins, which straddles both sides of the river just south of the federal land. Lowery’s attracts many of the same families each year. Some take their RVs. Others own cabins there. By day, the families swim and picnic together. At night, they gather on decks strung with ropes of festive lights or wander from cabin to cabin, illuminated by tall lamps placed on poles throughout the area. The Basinger and Smith families pulled into Lowery’s on Thursday afternoon, June 10. But the older boys wanted to sleep in a tent, and Lowery’s didn’t allow tent camping. That meant moving the families to Loop D at the federal campground. Everyone felt a pang of disloyalty, but Jesse Lowery, who ran the RV park and liked hanging out with Shane and Anthony, told them not to worry. They could return the next day. The families set up camp at Loop D’s site No. 2. While Kerri and Candace cooked dinner, Shane and Anthony took the kids swimming. After supper and showers, the children settled into the Wildwood RV, where they watched Madagascar and played video games. As usual, the two mothers laid down with their excited brood, soothing them to sleep with whispers and lullabies. The women then went back outside, but returned to the RV after Anthony found a large, ugly insect and teased Kerri with it. “I’m going to bed,” she said, knowing from experience that Anthony wasn’t beyond putting bugs on her. “Me too,” Candace chimed in. By the time the women crawled into their beds, it was 11 p.m. The men joined them soon after. As Candace and Kerri slept deeply, the day’s intermittent rain became a downpour. John Lewis, a meteorologist with the National Weather Service in North Little Rock, sits at the computers he relied on for information on the night heavy rainfall flooded the Albert Pike campgrounds. At the National Weather Service office in North Little Rock, forecaster John Lewis settled in front of a trio of computers when his shift began at 11 p.m. Even though the office monitored weather for more than half of the counties in Arkansas, the overnight shift usually held little excitement. But Lewis expected this night to be more harried. He and other forecasters had been tracking a large, slow-moving storm system as it crossed Texas over the previous two days. On June 9, the system ravaged parts of central Texas along the Guadalupe and Comal rivers. It dumped at least 10 inches of rain there, inundating packed campgrounds and flooding neighborhoods. Flood alarms along the Guadalupe sounded as those waters rose, triggering evacuations of people camped along the river’s banks. Despite the evacuations and rescue efforts, one tourist drowned. The next morning, the storm pounded the east Texas city of Tyler with 8 inches of rain before plodding toward Arkansas. Recognizing the potential danger, the North Little Rock office issued two flash-flood watches on June 10 for the next day. The first went out at 11:58 a.m. and warned of overnight showers. The forecaster on duty hoped that if he put a watch in effect before the noon news, more people would be aware of the possible danger. The second watch went out at 10:06 p.m. and noted that the greatest chances of heavy rain were in the southwest and central part of the state. Both watches covered 45 counties and lasted through Friday, June 11. By the time Lewis arrived for work the night of June 10, it had been raining off and on for hours in southwest Arkansas. Little happened during the first two hours of his shift. Just after 1 a.m., however, Lewis noticed a thunderstorm and heavy lightning over Polk and Montgomery counties. As rain thrashed the area, Lewis grew concerned that the already saturated ground would lead to a flash flood. At 1:57 a.m. he issued a flash-flood warning for portions of Garland, Pike, Polk and Montgomery counties, saying flash flooding was “likely.” Of most concern were areas near the cities of Glenwood, Caddo Gap and Langley — the latter only about 8 miles uphill from the Albert Pike campgrounds. Immediately, the warning was posted online, broadcast on weather radios and sent to all law enforcement agencies and emergency offices in the state. Lewis then walked five steps to the microphone that connects the Weather Service to a statewide emergency radio network and issued the warning again, just in case people weren’t paying attention the first time. In years past, the Forest Service had notified campers of flooding dangers when it had advance warning and the alerts were issued during business hours. Its primary focus, however, was the threat of forest fires. Employees monitored the weather 24 hours a day only during dry spells. Severe weather or predicted flooding didn’t prompt such vigilance. So on June 10, when the National Weather Service issued the two flash-flood watches, District Ranger Gloria Chrismer didn’t pay them much attention. She would later tell officials that she was not required to notify anyone about flood watches. The Weather Service issued them often, she would say, and they were usually of little consequence. Even when the skies unleashed an unrelenting torrent, neither Chrismer nor any other employees with the Forest Service felt compelled to keep an eye on the worsening weather. But in an office more than 100 miles away, Lewis and another North Little Rock forecaster hunkered down for the night with their radar and computers. A few minutes after Lewis issued the warning, state police Sgt. Brady Gore awoke to the steady thrum of a downpour on the tin roof of his family’s cabin near the Albert Pike campgrounds. 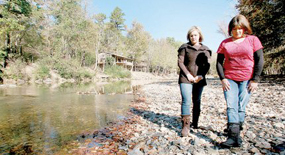 Janice McRae, a fifth-generation Lowery, stands in the cabin area of Lowery’s Camp Albert Pike RV Park and Cabins. The land has belonged to the Lowery family since the late 1800s. The Smiths and Basingers normally stayed at Lowery’s. He had decided at the last minute to meet his wife, Gina, there. His grandparents had owned the cabin — which sat on Lowery land — since the 1960s, and Brady had spent every childhood summer there that he could remember. Man, it’s really raining, he thought groggily. Bet the river is coming up a bit. Brady had seen it rain that hard before, but he’d never known the river to significantly escape its banks. Even the Lowerys, whose family has owned the property since President Rutherford B. Hayes signed their land grant in the late 1800s, had witnessed only one significant flood. In 1968, heavy rain triggered a flash flood that washed away cabins. No one was injured or killed. Lowery family lore held that a big flood occurred about every 50 years. Brady told himself he’d drive by the river to see how high it had gotten when he left for work in a few hours. Then he rolled over and fell back to sleep. Bill Paxton, who owned a cabin at Lowery’s, also woke about 2 a.m. He ventured out to move his truck and lawn mower to higher ground. As he sloshed back to his cabin, water swirled around his calves. Bill figured he’d better keep an eye on the river level. He turned on his outside lights and put on a pot of coffee. At that moment, a flood gauge about 8 miles downriver — the closest to the campground — marked the river level at 3.81 feet. Back in North Little Rock, Lewis pulled a state atlas off the shelf and began studying the terrain near Langley, which was being pounded by the storm. Immediately he noticed that several creeks and streams emptied into the Little Missouri just north of Albert Pike Recreation Area. He also noticed that the river and campgrounds were in a valley, meaning water running off the mountains could contribute significantly to flooding. Unbeknownst to forecasters, the river already was rising rapidly. In 15 minutes, it had risen by nearly a foot. At the Paxton cabin, Bill stood on his balcony with a cup of coffee. His cabin stilts were 8 feet tall, but Bill now wondered if he should have set the cabin a little higher. Reuben and Kathryn Cleveland, 70 and 78, were the volunteer camp hosts at Albert Pike. Nothing in their camp host instructions had prepared them for a raging river and terrified campers. So when a group of people banged on the door of the Clevelands’ 1985 Toyota motor home about 2:30 a.m., they weren’t sure what to do. Register campers as they arrive. Call in problems to the Forest Service. Keep the campsites clean and maintained. But there was a lot the Clevelands didn’t know, like the fact that Loop D sat in a 100-year flood plain. And that a number of flash floods had occurred over the years, one of them just three days after Loop D opened in June 2004. In the mid-90s, high water in what would become Loop D had trapped more than 40 Boy Scouts as they returned from hiking the Eagle Rock Loop Trail. After the Scouts were rescued, park employees assured a scoutmaster that they planned to put in a flood alarm system. Such a system was never installed. Like many campers, the Clevelands were unaware of the area’s tendency to flood. The Forest Service had never put up flash-flood warning signs, so threats of rain or storms went largely unheeded by visitors. During their orientation, the Clevelands were given maps, an emergency phone list, registration envelopes, a first-aid kit and a telephone connected to a landline. Because of the nonexistent cell-phone service, the Clevelands’ landline would be their only means of communicating with the outside world. Reuben and Kathryn had worked as camp hosts all over the country. Usually, rangers or park personnel remained close to campgrounds. At Albert Pike, however, the Ranger District Office was nearly a 40-minute drive away and closed at 5:30 p.m.
Rangers didn’t patrol at night. On weekends, a designated deputy from the Montgomery County sheriff’s office made rounds at the campgrounds. The Clevelands were unaware that the storms predicted for June 10 and 11 could cause flash flooding. No Forest Service employees told them about the flood watches that had been issued. Even if someone had, it’s unclear how much that would have helped. The Ouachita National Forest didn’t have an emergency plan or evacuation plan for such an occurrence. So when people began beating on the door of the Clevelands’ motor home, the couple panicked. The district office was closed, leaving them with no employees to turn to. Kathryn decided to call 911. As she headed for the phone, Kathryn felt the motor home move. The dispatcher asked her to stay on the phone. Six minutes after the Clevelands’ 911 call, at 2:44 a.m., Montgomery County deputies began heading toward Albert Pike. Meanwhile, Bill Paxton still stood on his balcony, anxiously watching the water’s rapid rise. That’s when RVs started floating by. Frightened, Bill called Lowery’s owners Denver and Janice McRae, who slept soundly. The McRaes’ home, while on Lowery land, sat well above the river and away from the cabins. Bill went back out to the balcony. An RV appeared to be headed straight for his cabin. Bill could see people, illuminated by flashlights, inside. The motor home hit a tree and became wedged against Bill’s porch stairs. An elderly man inside managed to wrest the door open 18 inches. He squeezed a 9-year-old girl through the narrow opening. “Take my granddaughter,” he begged Bill. After Bill pulled the child to safety, the man and his wife escaped through the small opening just before the RV shifted and closed the door for good. Everyone breathed a collective sigh of relief — until the furniture in Bill’s cabin started floating. Bill called the McRaes again. “The water’s coming in the house,” he told them. Janice called 911. She spoke to a Montgomery County dispatcher. Because the Albert Pike area is so remote, the McRaes had cleared a portion of their property so that helicopters could land in the event of an emergency. But the dispatcher said crews couldn’t get a helicopter in until morning. Rescuers, the dispatcher assured her, were on the way. But he didn’t sound that concerned to Janice. After hanging up, she thought immediately of an elderly couple who owned a cabin that didn’t sit on stilts. She and Denver rushed toward the cabin. Water skimmed over the eaves. Janice’s heart sank. The couple, however, had fled to the Lowerys’ store. They were safe. By then, forecaster John Lewis had keyed in on the Albert Pike Recreation Area, guessing correctly that warm weather had drawn campers to the area for a long weekend. He issued a flash-flood statement — an update to the earlier warning, which referred to Albert Pike specifically — and then began calling the sheriff’s offices in the hardest-hit counties. The Montgomery County dispatcher confirmed what Lewis suspected: Water had begun to inundate Albert Pike. But the dispatcher seemed unalarmed, acting as though flooding at Albert Pike was normal. If the dispatcher understood the severity of what was happening, he did not convey that to Lewis. By 3 a.m., the Langley gauge recorded a water level of 9.87 feet — 4 feet higher than it had been 30 minutes earlier. Within 15 minutes, the level increased nearly 3 more feet. Creeks overflowed, blocking the roads leading to Albert Pike and preventing rescuers from getting any closer. At 3:30 a.m., the gauge hit 13.91 feet. That’s when Sgt. Brady Gore and his wife, Gina, were jolted awake by someone pounding on their back door. “Get up! Get out now!” a voice yelled. Profanities laced the command. When the Gores opened the door, they heard the rush of water. Two wet and disheveled strangers stood on the deck under the glow of the family’s porch light, cussing and shouting. “What is the problem?” an irate Gina demanded of the two men. She wondered if she and Brady were about to be robbed. One of the men pointed his flashlight at the deck. “That’s the problem,” he said. The Gores’ cabin sat on a ridge, three rows back from the river, yet water lapped at the deck. The couple dressed and ran out the front door, which faced away from the river. They ran for their cars, which they’d parked near their cabin. The couple heard loud noises. POP! BOOM! Brady turned toward the sound and saw the cabin just below his tear away from its foundation and float away. Then an arc of electricity flashed below them.